Hearts & Voices is a collaboration with Rossendale Hospice, 2nd Rossendale Scout band and Chant Productions. 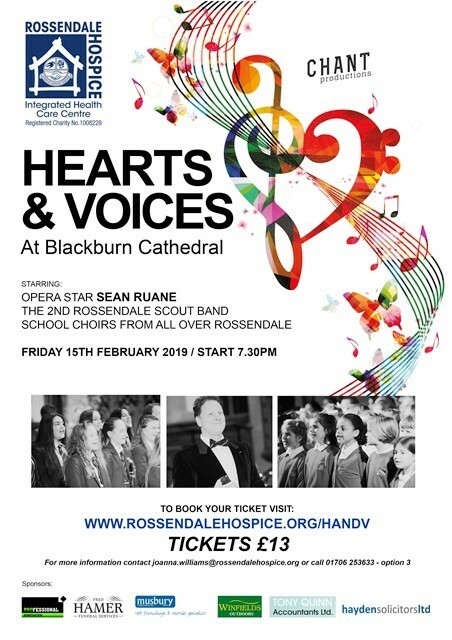 Over 200 children sang alongside Sean Ruane in the magnificent Hearts & Voices concert organised by Chant Productions, the 2nd Rossendale Scout band and Rossendale Hospice. Songs from the Greatest Showman were amongst the favourites performed by 10 schools from across the valley. Graham Helm of the 2nd Rossendale Scout band came up with the idea of putting together a collaboration to raise funds for Rossendale Hospice. This year's event was the fourth concert held at Blackburn Cathedral which raised £4900 on Friday 15th February. Sean Ruane, local opera singer, visited the 10 schools that took part and provided tuition to each choir in preparation for the concert which saw over 350 guests attend. The event was a great success the money raised will help provide vital services to those in Rossendale who need it. We are extremely grateful for the support our local schools and their families offer us but also to the sponsors of the event – Musbury Fabrics, Winfields, Fred Hamer Funeral Services, Hayden Solicitors, Tony Quinn Accountants and Professional Remediation for their financial contributions. Special thanks also go to Shooters Media, Lite Alternative, Resonate Production Services, AJM Photography, HD Signs and our volunteers who helped on the night. See below for our gallery of photos from Hearts and Voices 2019.